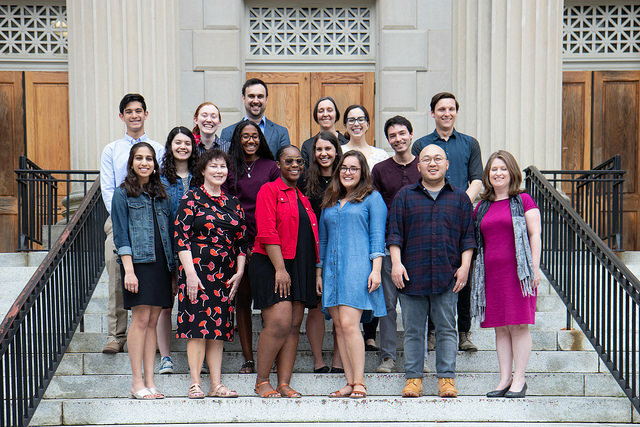 To celebrate the 200th anniversary of the groundbreaking modern novel, members of Professor Jeanne Moskal’s English class reconstruct the world in which Mary Shelley created Frankenstein’s monster. 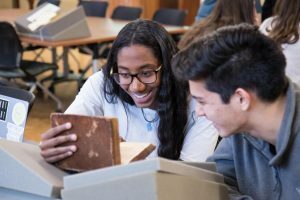 Working with the instructor, the Graduate Research Consultant, and UNC librarians, students curate a public exhibit of rare materials from UNC Libraries. The exhibition focuses on issues such as political turmoil in England and France, global exploration, medical experimentation and sexual liberation. 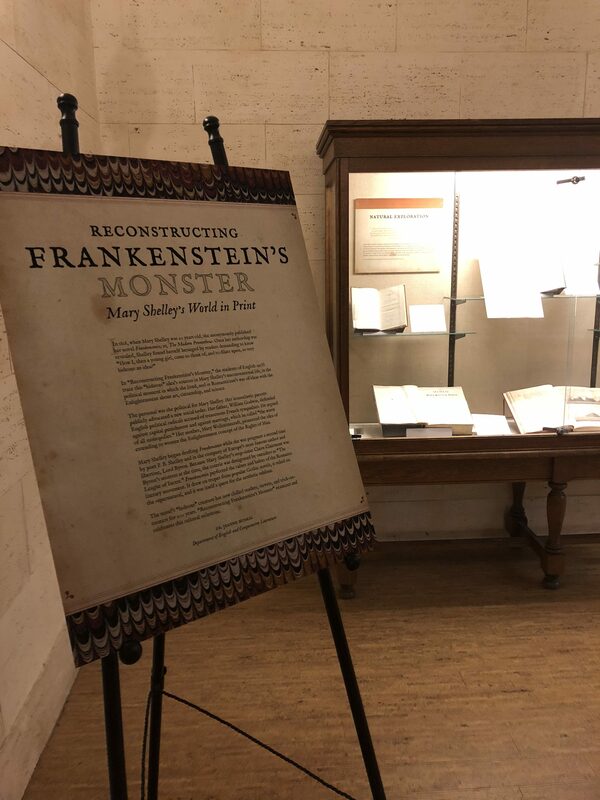 On view will be the Library’s first edition of “Frankenstein,” along with a newly acquired second edition, important because of significant changes. The exhibit will be on view in the Melba Remig Saltarelli Exhibit Room in Wilson Library through August 26, 2018. 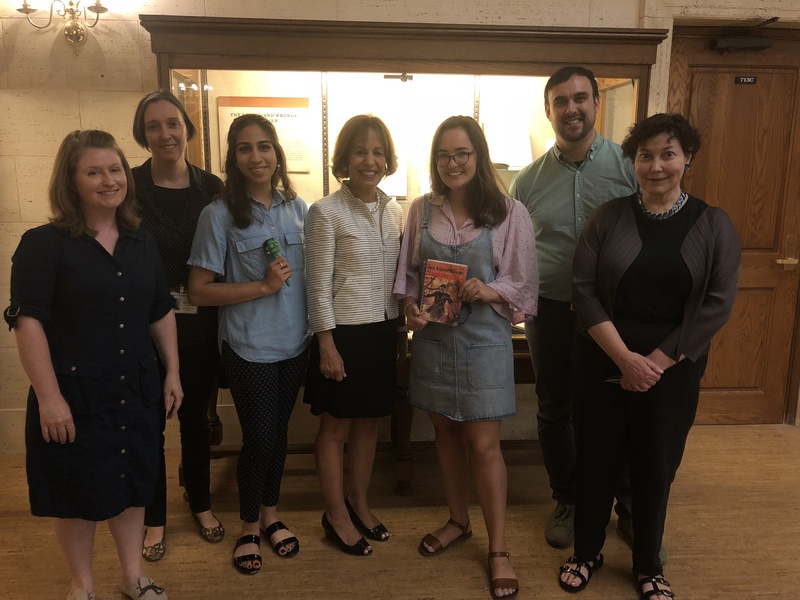 Front Row, L to R: Shraya Changela, Jeanne Moskal (Instructor), Tierra Winstead, Blythe Gulley, Edward Yang, Emily Kader (Rare Book Research Librarian). Second Row, L to R: Rachel Dango, Malaika Swaminathan-Sipp, Caroline Alessandro, Deren Pulley. Back Row, L to R: Jacob Katz, Madison Boos, Grant Glass (Graduate Research Consultant), Rachel Reynolds (Special Collections Exhibit Coordinator), Emily Sferra, Rory Sullivan. Not shown: Ashley Cruz. With considerable envy, Mary Shelley’s step-sister characterized Frankenstein as “a novel that by its originality knock[ed] all other novels on the head.” Celebrations worldwide have commemorated this disruptive novel and its 200 years of cultural influence. Frankenstein has given us the go-to metaphor for humanity’s relationship to science, as the word “FrankenFoods” attests. It has inspired innumerable reboots in film, TV, and material culture. 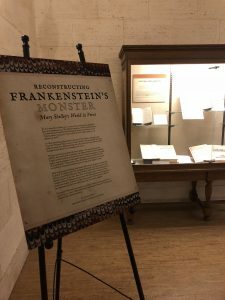 This exhibit returns us to sources of the 1818 novel, walking us through the plot, quoting salient passages, and displaying carefully-chosen objects that illuminate Mary Shelley’s world. Mary Shelley was the same age as our undergraduate curators when she wrote and published Frankenstein. Most days this semester, I have witnessed firsthand the curators’ creativity, their smarts, and their ability to ask hard questions. And, many evenings this semester, I have been riveted by screens where young student activists prick our gun-numbed consciences. These contrapuntal experiences have fostered a new hope in me for the future our students and their nationwide cohort will lead. Photos by Aleah Howell, University Libraries.